Plans for safer 10th/John crossing to Capitol Hill Station, Melrose enhancements make street fund cut. The East District Council in a meeting Monday ranked the proposals from Central Seattle Greenways as the top choice for funding in the area. The $90,000 continuation of improvements from the group organizing the Melrose Promenade project and the Central Greenways-championed 10th and John project must be approved by the Seattle Department of Transportation before implementation. 10th and John has long been a challenging crossing for pedestrians and drivers and the situation is even more critical with the increased activity in the area with the opening of Capitol Hill Station. The raised intersection could help make it easier to cross and help make the intersection safer for travelers of all types. Capitol Hill Times. 3/30/16. Community Groups Responding To Traffic Safety Concerns At Bailey Gatzert Elementary. Led by Central Seattle Greenways member Brie Gyncild, concerned parents, community group members and Bailey Gatzert principal Greg Imel walked the streets around the elementary school on Wednesday, March 16, documenting dangerous intersections and strategizing how they could be improved. Brandon Macz. Capitol Hill Times 3/18/16. You Can Bring Your Bike on Light Rail, but Maybe Don’t Bring Your Cargo Bike—For Now In an open letter, the transportation advocacy group Seattle Neighborhood Greenways called on Sound Transit to offer more bicycle lockers that fit cargo bikes, so that families that use cargo bikes can store them before jumping on the train. In the meantime, the group said, the transit agency should purchase “flex” light rail cars with more open space to fit larger bicycles, oversize luggage, mobility devices, strollers, and more.Ansel Herz. Seattle Stranger 3/16/16. Finalists Announced: Who Will Take Home An Advocacy Award? Forget Hollywood. The Oscars may be over, but the best awards show is yet to come. The Alliance will open the envelopes for the 2016 Advocacy Awards, honoring excellence in the walking and biking movement including Cathy Tuttle, Seattle Neighborhood Greenways, Advocate of the Year and Cascade Bicycle Club, for its winning Move Seattle Levy campaign. Carolyn Szczepanski. Bike Walk Alliance 3/3/16. Seattle Neighborhood Greenways Gets Federal Award for Safe Streets Work. The National Highway Traffic Safety Administration (NHTSA) will recognize Seattle Neighborhood Greenways Director Cathy Tuttle with a Lifesavers Public Service Award. Yep, the Feds have noticed the work of this humble grassroots safe streets organization, organizing neighborhood-by-neighborhood to develop bike routes and safe streets that everyone can feel safe using regardless of age or ability. Tom Fucoloro. Seattle Bike Blog 2/22/16. Delridge Greenway Update. Project design of the neighborhood greenway is locally funded by the nine-year voter-approved Bridging the Gap Levy. This project is part of a $3.8 million budget to design and construct the 2015 Ballard and Delridge-Highland Park Greenways. Norm Mah. SDOT blog 2/19/16. Pronto for Seattle? Rainier Valley Greenways/Seattle Neighborhood Greenways staff Phyllis Porter, Seattle Bike Blog Editor Tom Fucoloro, SDOT Active Transportation Chief Nicole Freedman, Councilmember Mike O’Brien, and persistently anti-bike Fremont business leader Suzie Burke discuss Pronto Bike Share. Brian Callanan. Seattle Channel Inside/Out 2/12/16. Beacon Hill Safe Streets Walk & Solutions Meeting Wherevent 2/6/16. Students Learn About the Safe Routes to School Program. Monica Sweet, an active member of Lake City Greenways, presented the importance of reflectors for visibility at night. Danielle Calubaquib. SDOT Blog 2/1/16. Choosing to Fund Streets for People. If we are going to create the cities and regions we want, we have to spend more on updating streets for walking, biking and accessible local transit than we do on useless stroads and megaprojects. We’re not close to the level of funding needed to retrofit local streets for people with a desperate need to get safely to school, build thriving local businesses, age in place, and live healthy productive lives. Cathy Tuttle. Strong Towns 1/28/16. Sustainability Segment: Guest Jack Tomkinson. Jack speaks with Diane Horn about the work of Urban Sparks to facilitate the creation and improvement of public spaces references the important public space work of Seattle Neighborhood Greenways. Diane Horn. KEXP 1/23/16. Doomsday Driverless Scenarios. Queen Anne Greenways from Seattle created a list of over 50 different doomsday scenarios that could occur if driverless cars eventuate. While they’re a bit of fun some also seem scarcely accurate. Matt L. Transportblog New Zealand 1/7/16. Citizen group forms department of ‘transformation’ to make urban fixes. A citizen group calling itself the Seattle Department of Transformation has said it will show how simple fixes can improve street safety, beginning with a move that created a walkway for pedestrians near Roosevelt High School. Natasha Chen. KIRO7 1/11/16. Fixing Rainier. Rainier Avenue has one-fourth the vehicle volume of Aurora, but twice the accidents per mile — over one a day. For Seattle Neighborhood Greenways staff Phyllis Porter, it’s a simple conclusion: “Congestion or injuries. Congestion or collisions. Congestion or fatalities.” Stephen Hegg. KCTS9 1/28/16. Bob Young. Seattle Times 12/26/15. North Seattle neighbors working for a successful and family-friendly Lake City. Many of the participants holding signs yesterday are part of Lake City Greenways, a local advocacy group working to develop safe streets for pedestrians, bicyclists and cars. To learn more, visit the Lake City Greenways’ Facebook page. 11/30/15. Families for Lake City. Seattle Just Voted to Build 250 Blocks of “Alternative” Sidewalks. In Seattle, traditional sidewalks cost about $300,000 per block if not more. “Nationally, it’s closer to $250,000 a block,” says Gordon Padelford, neighborhood support coordinator for a Seattle walking and biking advocacy group called Seattle Neighborhood Greenways. (Padelford is also a member of the city’s pedestrian advisory board.) “Some of [the higher cost] may have to do with Seattle’s iconic hills … our stringent stormwater requirements, Seattle Public Utilities not paying for drainage improvements [and that cost being borne by the new sidewalk], labor regulations, or over engineering. Whatever the reason, the city and sidewalk advocates think they can get 250 blocks of sidewalk for the cost of 150 by looking at alternative configurations. Rachel Kaufman. NEXT City 11/19/15. Metro Health Convenes Hundreds to Work for a Safer Healthier City. San Antonio, Keynote Speaker Cathy Tuttle said, “suffers from a high incidence of “traffic violence. People should stop calling pedestrian killings by vehicle drivers an accident,” Tuttle said. According to Tuttle, positive change in neighborhood and street safety starts with people. Tuttle encouraged San Antonio to use Seattle Neighborhood Greenways model for engaging residents and urging policymakers to create change. Lea Thompson. Rivard Report 11/14/15. On Modern Transportation, Seattle Just Voted to Soar. Advocacy group Seattle Neighborhood Greenways celebrated Tuesday’s victory with a call for urgent action on Wednesday for the city to follow up on voters’ mandate by building key parts of Move Seattle in the next year: “Important as it is to maintain what we have, we passed a nearly billion dollar transportation levy because we’re ready to transform Seattle, not just to maintain it,” the group wrote. “Seattle is playing host to the ‘Olympics’ of street engineers and activists next September when NACTO (National Association of City Transportation Officials) comes to town. Since NACTO centers around walking and biking tours of the best each city has to offer, it is a perfect opportunity to ramp up our visible, transformational infrastructure.” Michael Anderson. People For Bikes 11/5/15. Let’s Get Ready For #NACTO16. Our local Seattle Neighborhood Greenways groups and volunteers worked hard to get the Move Seattle Levy passed. Thank you voters! Our challenge now is to SDOT and the Mayor: We’re inviting the neighbors over to see our streets. Let’s get Seattle ready for ‪#‎NACTO16‬! Now it is time get to work to quickly transform Seattle into a safe, healthy, equitable city where people can safely walk, roll, and bike. Cathy Tuttle. The Urbanist 11/4/15. The 2015 Community Impact Awards: Nonprofit of the Year. Seattle Neighborhood Greenways wins Community Impact Silver Award. A coalition of 20 local groups, Seattle Neighborhood Greenways advocates for safe, vibrant streets. Its efforts helped influence the city of Seattle to spend more than $25 million on projects such as Seattle Summer Streets, the Parklets Program and Safe Routes to School. Based on work by coalition members, the Seattle City Council included 245 miles of greenways in the city’s Bicycle Master Plan. Next up: providing input as the city prepares pedestrian and transit master plans. Jeanne Lang Jones. Seattle Business Magazine November 2015. How Seattle is Using a “Frankenbike” to Improve its Bike Trails. Partially due to my experiences advocating for Neighborhood Greenways in Seattle I realized the Herculean task government has in keeping up to date on their infrastructure. I knew that things that I saw everyday, that could be improved on the road, would never get to planners and engineers at the resolution of my daily experiences. The process of creating the bike really was the process of a hobby getting away from me. I initially wanted to measure one thing in my commute for curiosity’s sake, and it lead to several increases in computing power, more batteries and the addition of more sensors. Heather Hansman. Smithsonian Magazine 10/29/15. In Seattle’s Sidewalk-less District 5, Voters Want A City Council Rep Who Walks The Talk. Janine Blaeloch from Lake City Greenways explains Streets without Sidewalks on KPLU: “It’s about dignity. Why should people who are using their feet to get from place to place have to go through such harrowing experiences, feeling they’re in danger and also feeling like they’re being disrespected?” In far-north District 5, many voters point to the city’s densest collection of streets without sidewalks, and hope that walkability will get more attention when one of theirs is on the council. Gabriel Spitzer. KPLU 10/23/15. An interview with Dongho Chang, Complete Streets engineer. Seattle Neighborhood Greenways is an amazing, amazing non-profit. They are people living in the community that are focused on the residential streets. They work closely with us to help us understand the needs and barriers. The membership lives in the community. They tell us where people want to cross but are afraid to, which helps us prioritize projects that staff may not know about. Hanna Kite. Smart Growth America 10/22/15. Build Sidewalks Cheaper, Faster To Stretch Seattle Levy Money, Says Mayor. North Seattle doesn’t have enough sidewalks. Just ask Monica Sweet. She’s with a neighborhood group called Lake City Greenways. “I’m watching kids walk in the darkest part of the wintertime and watching cars swing around and being worried about getting people hit,” she said. “Your heart goes out, you want to come up with solutions. And it’s hard when it’s a pricey solution. Sidewalks cost a lot of money.” Joshua McNichols. KUOW 10/21/15. SNG: Imagining a Truly Bike-Friendly Uptown and South Lake Union. Seattle Bike Blog 10/7/15. Let’s Talk About Lane Width. Lane width helps to control speed on urban streets. People driving tend to slow when streets are narrow. As we move towards Vision Zero standards in Seattle, let’s examine the width of our streets as one of the contributing factors of our safety. Cathy Tuttle. The Urbanist 9/28/15. Seattle Greenways Returns to Park(ing) Day’s Activist Roots. Seattle Greenways decided to add a dash of tactical urbanist rebellion back into the mix during this year’s Park(ing) Day this past Friday. The ped and bike group asked its members to submit Park(ing) Day Plus ideas where they took advantage of the set-aside day to introduce street fixes that they think should stick. Their grand winner: A 2,000-foot protected bike lane on Rainier; here’s awesome video of a parent and their four-year-old biking along the usually treacherous road. Josh Feit. Seattle Met 9/21/15. PARK(ing) Day is Back Again, Opportunity to Transform Space For People. Our friends at Seattle Neighborhood Greenways who are running a fun and smart competition to demonstrate safe street designs using ordinary parking spaces and the ingenuity of volunteers. Stephen Fesler. The Urbanist 9/17/15. Seattle PARK(ing) Day is Friday Ballard NW 65th & 6th NW. In Ballard, Chris Saleeba often bikes with his four-year-old daughter to the Ballard Farmer’s Market. Chris teamed up with his co-workers at Alta Design & Planning to design a protected intersection for people who walk and ride bikes across NW 65th St at 6th Ave NW. Saleeba, along with his friends and neighbors from Ballard Greenways, will build and staff the intersection from 10 a.m. to 7 p.m. on Friday for PARK(ing) Day and 11 a.m. to 3 p.m. on Saturday during the Ballard Summer Parkways and Sustainable Ballard Festival. Meghan Walker. My Ballard 9/17/15. Friday’s Park(ing) Day will be Seattle’s biggest yet: Over 50 pop-up parks planned. The most ambitious project, requiring a ton of volunteers and planning, is a couple blocks of protected bike lanes on Rainier Ave in Columbia City. Other SNG safe streets plans include a protected intersection crossing at 6th Ave NW & NW 65th Street in Ballard, an protected bike lane on NE 65th Street at 22nd Ave NE in Ravenna and a safer Burke-Gilman Trail crossing at 40th Ave NE. Tom Fucoloro Seattle Bike Blog 9/16/15. Zeytuna Edo and the New Seattle Traffic Safety Measures. How a young girl’s near fatal accident changed the face of Seattle traffic safety. Josh Feit. Seattle Met 7/29/15. Small Businesses Promote Safer Roads in Seattle. Spoke & Food supports Seattle Neighborhood Greenways, Seattle’s safe streets advocacy organization. With interviews with Madi Carlson (Wallingford Greenways) and G&O Family Bikery Owner Davey Oil. Natalie Swaby. KING 5 News 7/28/15. Bike to dinner Tuesday to help fund Seattle Neighborhood Greenways. Tom Fuculoro. Seattle Bike Blog 7/27/15. District 5: Far North Seattle is Where the Sidewalk Ends. Report on walkable streets without sidewalks with Lake City Greenways leader Janine Blaeloch. Gabriel Spitzer. KPLU 7/24/15. Sprache im Verkehr: Positives Klima danke Kampagne. Was sich bis jetzt nur nach grauer Theorie anhört, hat sich bereits bewährt. In Seattle startete die Bürgerinitiative „Seattle Neighborhood Greenways” eine Kampagne zur Sprachsensibilisierung in Bezug auf den Verkehr. Stefan Edlerer. Bike Citizens 7/22/15. Primary ballots are in the mail! Here’s what candidates say about safe streets. A brief look at some candidates in each race and where they stand on safe streets and bicycling. Many include quotes from candidates in response to a short and to-the-pointSeattle Neighborhood Greenways questionnaire. (SNG is a 501(c)3, so they can’t endorse candidates. But they can ask candidates questions and publish their answers. )Tom Fucoloro. Seattle Bike Blog 7/17/15. What’s the Most Important Acronym on Seattle Streets? The Seattle ROWIM or Right Of Way Improvement Manual may be the most important acronym guiding the development of Seattle streets today. Cathy Tuttle. The Urbanist 7/23/15. Check out the ten miles of car-free Summer Parkways in the Central District and Ballard. These could be some of the best family and community events all year. Tom Fuculoro. Seattle Bike Blog 7/16/15. Salomon: Seattle’s newest protected bike lane just part of normal street maintenance. The lack of driveways make the protected bike lane feel exceptionally safe and comfortable. However, the intersections have absolutely no improvements at all. Andres Salomon. Seattle Bike Blog 7/11/15. Streets Experiments Made This City Engineer a Celebrity Bureaucrat. For Cathy Tuttle, executive director of nonprofit Seattle Neighborhood Greenways, it’s Chang’s ability to listen to the community and more. “Dongho has complete and utter passion for his work. He loves to see signs of life on streets as indicators of the success of street improvements. He’s willing to experiment.” Greenways recognized Chang with its 2014 Innovation Awardfor “goofy-looking but super-safe curb bollard extensions.” Josh Cohen. Next City 7/6/15. RIGHT-OF-WAY DECLARATION OF INDEPENDENCE & BILL OF RIGHTS. We the people recognize that the ownership or use of a private vehicle does not imply the sole ownership of the public Right-of-Way.Cathy Tuttle. The Urbanist 7/4/15. Seattle 2035 Transportation Element. Rather than measure and base our transportation network on roadway capacity for vehicle-only level of service, measure the through-put of people – walking, riding buses and trains, in delivery vehicles, riding bikes, driving cars. The metrics we set for “person-trips” will help us fund and build the complete networks we want in the future. Cathy Tuttle. The Urbanist 6/17/15. Two Experts on the Words and Images That Diffuse Anti-Bike Sentiment. Cathy Tuttle, executive director of the advocacy group Seattle Neighborhood Greenways, works with her colleague Gordon Padelford to develop resources like these that help her fellow biking believers choose language that makes people feel included in the benefits of bike improvements. Michael Anderson. People For Bikes 6/11/15. Group Trudges on To Make Walk to School Safer. Safe streets are a health issue in more ways than one, said Greenways director Tuttle. Across the U.S., the percentage of students who walk or bike to school has been dropping since the 1970s, even as more children are overweight. Walking and biking to school should be safe choices for more children in all neighborhoods, Tuttle said. Jerry Large. Seattle Times 6/7/15. Walking Advocates Push for Bigger Piece of Seattle Transportation Levy. A late push is on for elected officials in Seattle to move $31 million more toward Safe Routes to School, in a $930 million fall levy. Mike Lindblom. Seattle Times 6/6/15. Safe Walk Routes to Schools. Greenways director Cathy Tuttle says she’s well aware of the $47 million figure, but she says much of that—the $33 million from cameras—is already part of SDOT’s ongoing Safe Routes to School budget, levy or no levy. Tuttle says Seattle Greenways wants an additional $40 million in the levy proper, on top of the money that’s part of the regular budget. Melissa Westbrook. Seattle Schools Community Forum 6/5/15. Pedestrian Advocates Continue To Press Mayor. Seattle Greenways wants the Levy to fund a series of pedestrian upgrades. Josh Feit. Publicola 6/4/15. Seattle Residents Weigh In On City’s Transportation Levy. KIROTV 6/3/15. Pedestrian Activists Say Murray’s Transportation Levy Falls Short By Millions. Josh Feit. Publicola 6/3/15. Talking Biking: Language that Defuses Bike Backlash. Words shape thoughts. Two skilled communicators from cities that have successfully overcome intense backlashes against bicycle infrastructure will share their tactics and experiences and take your questions. Featuring Cathy Tuttle, Executive Director of Seattle Neighborhood Greenways, and Doug Gordon of BrooklynSpoke.com, in conversation with PeopleForBikes staff writer Michael Andersen. Association of Pedestrian and Bicycle Professionals 6/3/15. Seattle residents weigh in on city’s transportation levy. Representatives of Seattle Family Biking, Seattle Neighborhood Greenways, and Cascade Bicycle Club Connect Seattle ask for more levy funding for safe walking and biking. Henry Rosoff. KIRO-TV 6/2/15. Construction Zone Mobility. Room for Improvement. Seattle is a boom town. Until recently, traffic plans during new building construction disregarded the mobility of people walking and biking beside building sites. This disregard is a safety issue, not just an inconvenience. Cecelia Roussel & Cathy Tuttle. The Urbanist 5/25/15. Seattle’s antidote to aggressive driving on neighborhood greenways. Bike Porlland 5/23/15. Harrell at Rainier Ave Safety Protest: We’re Gonna Take Our Street Back. At street action organized by Rainier Valley Greenways, Bike Works, Seattle Neighborhood Greenways & Cascade Bicycle Club, Councilmember Bruce Harrell said, “What I have in back of me is basically a freeway,” Hundreds of people have been injured within just a couple blocks of this intersection in the past ten years. “This is the beginning of what we’re gonna do with Rainier Avenue. We’re gonna take our street back.” Tom Fuculoro. Seattle Bike Blog 5/21/15. Community pressuring city for safety fixes on dangerous street. “We’re calling out to the city today to act now to fix the most dangerous street in Seattle,” said Phyllis Porter of Rainier Valley Greenways. Michelle Esteban. KOMO4news 5/20/15. Move Seattle: Wallingford Shows the Council They Care. While we were on the walk all three council members spoke in favor of improving Wallingford’s connection to the U-District, along with several community members. Tom Rasmussen, chair of the Seattle City Council transportation committee, said he would have SDOT draw up a response to our request. Eric Fisk. Wallyhood 5/18/15. Seattle’s Most Dangerous Street. Neighbors are demanding action at Rainier Valley Greenways crosswalk action. Henry Rosoff. KIRO7TV 5/20/15. Seattle Drops Off Top Ten List Of Best Cities For Bicycles. A Good Thing, Says Advocate. Ross Reynolds speaks with Cathy Tuttle, executive director of Seattle Neighborhood Greenways, about what a “sharrow” is, how it helped knock Seattle off the top-10 list of most bikeable cities in America and why she thinks that’s a very “healthy” change. Posey Gruner & Ross Reynolds. KUOW The Record 5/15/15. Seattle’s $900 million transportation package just got bigger. Seattle Neighborhood Greenways has been advocating for more funding for pedestrian improvements around low-income schools. The revised plan is a big improvement over the original, but the group will continue to advocate for even more. “We’re hoping to have a little bit more for pedestrian safety, for people who walk and bike. We really need to focus on that because we have this opportunity over the next 10 years to transform this city into a very livable place for people,” Tuttle said. Deborah Wang. KUOW 5/7/15. For South End hit-and-run victims: Tragedy, then limbo. Community advocates called the apparent lack of follow-up out of character for Mayor Ed Murray, who they said has shown real dedication to pedestrian safety. Tom James. South Seattle Emerald 5/4/15. Seattle Neighborhood Greenways: A Grassroots Movement On A Roll. We have literally gone from spray-painting bikes on our arterial roads to a Bicycle Master Plan that has a connected network of neighborhood greenways, multiple-use trails, and protective bicycle lanes across the entire city… most of that connected route network came from volunteer greenway scouts in 15 local neighborhood groups. Seattle Parks Foundation Newsletter. Spring 2015. Cathy Tuttle Is The New Face Of Bike Activism. Seattle Neighborhood Greenways is shifting the conversation about bikes from spandex to training wheels. Josh Feit. Seattle MET May 2015. How to End the War On Cars. While the SNG publicly advocated for biking, they never publicly labeled themselves cycling advocates. In light of the “war”, they opted for the less inflammatory title, “neighborhood advocates”.. The effect was remarkable. Slowly but surely the war on cars language changed. Hilary Angus. Momentum Magazine 4/22/15. 2015 City Council Makes A More Important Appointment. A policy maker high up the food chain at SDOT recently told me that Seattle Greenways, now made up of 20 neighborhood groups around the city, is replacing the influence of the antiurbanist neighborhood councils. Josh Feit. Publicola 4/21/15. FOLLOWUP: Original 35th SW safety petition reopened, in response to opposition petition West Seattle Bike Connections and Seattle Neighborhood Greenways reopen a speed-limit reduction petition. West Seattle Blog. 4/13/15. Community asks for changes on 7-way intersection. Queen Anne Greenways gets SDOT to consider making improvements. Possible changes include cutting back vegetation to improve sight lines, painting curbs and giving walkers more space. Amy Moreno. KING-5 4/13/15. Transportation in Seattle and Mayor Ed Murray’s Move Seattle proposal. The issues surrounding this $900 million plan. With Scott Kubly at Department of Transportation, Cathy Tuttle of Seattle Neighborhood Greenways, Suzie Burke from the Fremont neighborhood, and Bob Pishue of Washington Policy Center. Brian Callanan. Seattle Channel 4/3/15. Vision Zero podcast w Jim Curtin & Cathy Tuttle. Half hour discussion of Vision Zero and Seattle Neighborhood Greenways on Mind Over Matters. Diane Horn. KEXP 3/3/15. Neighbors sick of speeders push to create Home Zone. Brianna McDonald consulted the Seattle Greenways organization, and came up with a plan to propose what’s called a Home Zone. It would lower the speed limits from 25 miles an hour to 10 or 15 miles an hour in a neighborhood that has no sidewalks. David Ham. KIRO-TV 3/3/15. The Lucky One (Surviving Rainier Avenue). We are all victims of cowardly traffic violence whether we are physically, emotionally, mentally or socially involved, there is a connection; be it family, friend, neighbor, or an execution of hit-and-run, speeding, or cars jumping curbs, this path will continue if we don’t do something to end this nonsense. Phyllis Porter. South Seattle Emerald 2/23/15. Seattle Neighborhood Greenways & Vision Zero. Guests Cathy Tuttle, Executive Director, Seattle Neighborhood Greenways, and Jim Curtin, Traffic Safety Coordinator, Seattle Department of Transportation, speak with Diane Horn about Seattle Neighborhood Greenways and Seattle’s Vision Zero plan. KEXP Mind Over Matters Sustainability Segment Podcast 2/21/15. Road Diet Data: Studies show projects lead to safer roadways. The Seattle Department of Transportation has been performing road diets or road rechannelizations for decades and argues that these projects bring about safer streets without affecting traffic volumes. SDOT collects data on traffic volume, vehicle speeds, and collisions both before and after each project. In a joint effort with Seattle Neighborhood Greenways, I’ve reviewed the studies and found SDOT’s claims to be true. Troy Heerwagen. Walking in Seattle 2/16/15. How Smart Language Helped End Seattle’s Paralyzing Bikelash. No single organization has more to do with the city’s new language than a tiny nonprofit group called Seattle Neighborhood Greenways. SNG was founded in 2011, the year the “war on cars” meme peaked. Their goal: to advocate for a citywide network of low-traffic local streets, modeled on similar systems in Vancouver and Portland, that could be optimized for biking, walking and running. Though the group made no secret of their biking advocacy, they didn’t brand themselves as biking advocates. They branded themselves as neighborhood advocates. Together, the groups fought bad language with good language. Michael Anderson. Streetsblog USA 2/4/15. North Seattle group discusses options for Safe Routes to School. North Seattle’s recently formed Greenways group came together Tuesday evening to discuss street safety in their neighborhood. Millie Magner. Examiner 1/25/15. Mike McGinn: Fighting Bikelash with Seattle’s Former Mayor. Bikelash is a chance for new voices and new leaders to rise who can help lead the conversation beyond simply fighting for bike lanes here and there and toward a complete shift in how the city approaches safe streets. Seattle Neighborhood Greenways is the perfect example of this, and their energy has completely flipped bikelash on its head. Because bikelash is a knee-jerk response to the difficult concept that streets are not simply pipes for cars, and death and injury is not the acceptable cost of doing business in our city. It’s a culture shift, and no culture shift is easy. Josh Cohen. The Bicycle Story 11/25/14. A Mom Rediscovers Her Bike Neighborhood greenways don’t just benefit bikers. They help pedestrians—particularly the elderly, disabled, toddlers, or anyone else who needs a little more protection when crossing a busy street. They can also make residential streets safer and more pleasant for everyone who lives on them by reducing speeding and inattentive cut-through drivers. Jennifer Langston. Sightline. 11/18/14. 2014 Top 50 Bike-Friendly Cities #8 Seattle. Last December, dozens of residents draped in green scarves packed the city council chambers for a public hearing on a transformative new bike plan. They wore green to signify their allegiance with thousands of others who’ve joined the Seattle Neighborhood Greenways coalition since it was founded in 2012. 10/14 Bicycling Magazine. SDOT in the construction process of U-District Greenway. “The greenway will really preserve the characteristics of the neighborhood and the streets,” said Gordon Padelford, the neighborhood support coordinator with Seattle Neighborhood Greenways. “At the same time, it will create a really calm and friendly place where parents and kids feel safe to bike to the farmers market, or UW students can walk to the school without facing heavy traffic in street intersections.” Zezhou Jing. The Daily 10/27/14. New neighborhood greenways coming to Rainier Valley. According to SDOT, neighborhood greenways are safer, calmer residential streets that are easier for people to cross, discourage cut-thru traffic and keep speeds low, without banning cars or adding bike lanes. Rainier Valley Post. 9/21/14. A new North Star in bikeway design: “Build it for Isabella”. Bob Edmiston of Seattle Neighborhood Greenways, has created a useful riff on the concept with a character called “Wendy, the willing-but-wary cyclist.”. Michael Anderson People for Bikes 9/8/14. MP visade Lunds farliga cykelmiljöer. Swedish Green Party Member or Parliament joins Cathy Tuttle to demand better and greener bike paths. Bjöen Sjö. Sydsvenskan 8/28/14. Complete Streets: More to Go. The unique contribution of Seattle Neighborhood Greenways—and what distinguishes greenways that came top-down from Vancouver and Portland from the grassroots greenways ideas developed by communities in Seattle—is the idea of greenways as places for people. Many of Seattle’s grassroots greenways groups are blending ideas from many cities to develop ideas for street networks that serve local needs—shared streets, park space, trees and great places to walk and bike all have found a place along Seattle’s neighborhood greenways. Cathy Tuttle. Roads and Bridges 8/5/14. It’s time to give Summer Streets and Bicycle Sunday an energizing makeover. I had the opportunity to join [Seattle Neighborhood Greenways] members, Councilmember Sally Bagshaw, various city staff and Cascade Bicycle Club staff for a study trip to Northeast Portland’s Sunday Parkways event over the weekend. It was the second time I’ve been to a Sunday Parkways event there, but it’s still an overwhelmingly awesome thing to witness. Tom Fucoloro. Seattle Bike Blog. 7/31/14. Seattle’s friendliest insurgent group visits Portland, eager for wisdom and dispensing their own. Since its founding in 2011, Seattle Neighborhood Greenways has almost singlehandedly convinced the city to install 35 miles of bike routes modeled on Portland’s internationally famous 60-mile network of low-stress side streets. Now, by leading a weekend trip to Portland, the organization is paving the way for another import: a series of one-day summer open-streets festivals. Michael Anderson. Bike Portland. 7/30/14. Do neighborhood greenways increase cycling? Oh yes. If you were wondering whether the city’s investments in neighborhood greenways are effective, here’s your answer: A resounding yes. Tom Fucoloro. Seattle Bike Blog. 7/23/14. What Does It Take To Get Seattleites on Bikes? Bob Edmiston is on the steering committee for the Seattle bike group Neighborhood Greenways. He liked Geller’s data, but wanted to make it more accessible. So he created “Wendy,” a simple persona meant to represent “the interested but concerned.” Posey Gruener. KUOW. 7/11/14. Revamped bike plan to have separated lanes, back-street routes. The 2014 version is meant to serve what Councilmember Sally Bagshaw likes to call “willing but wary” riders. That’s a shift from earlier thinking — to apply pavement icons and bike lanes to busy streets, to establish that cyclists deserve their share of the road. But activists here and in other cities think they’re nearing the limit of how many people are willing to bike with other traffic. Mike Lindblom. Seattle Times 4/15/14. Seattle to Build Bike Lanes Away from Busy Streets. “I’m excited to see the Seattle Bike Plan actually call out the language of ‘all ages and abilities’ as its goal,” said Cathy Tuttle, director of Seattle Neighborhood Greenways. Mike Lindblom. Governing The States and Localities Magazine 4/14/14. Seattle’s new bike plan: ride on calmer backstreets. The Seattle Bicycle Master Plan update passes unanimously in City Council. “I’m excited to see it actually call out the language of ‘all ages and abilities’ as its goal,” said Cathy Tuttle, director of Seattle Neighborhood Greenways. She said most of the greenways were “crowdsourced” by neighbors’ suggestions. Tuttle said the city is getting more serious about sheltering greenway users, by adding speed humps and stop signs in new Delridge and Beacon Hill routes, for instance. Mike Lindblom. Seattle Times 4/14/14. Building, expansion of Seattle greenways to cost $1.8M. 6.2 miles to be constructed this year. Cathy Tuttle … said greenways are important because “they allow people mobility regardless of their age or their ability or their choice of the way that they get around and allows people to start using their streets as public places.” Safiya Merchant. Seattle Times 3/11/14. Partners for Progress. Partnership … We are working better with Seattle Neighborhood Greenways, a group that has electrified the conversation around livable streets and engaged a whole new generation of advocates. Elizabeth Kiker. Cascade Bicycle Club Blog 3/5/14. Special report: How Portland stopped building neighborhood greenways. Cathy Tuttle, executive director of Seattle Neighborhood Greenways, said in an interview Wednesday that Portland should be proud of its role in popularizing greenways, which she said aren’t so much a cheap way to build bikeways but a new way of thinking about what a city street can be. “People love their parks, and we’re trying to get people to love their streets the same way,” Tuttle said. The real “missing piece” in Portland’s neighborhood greenway network, Tuttle said, is that its biggest advocates have come mostly from the city government, not from private citizens. “It really does have to come from the community,” Tuttle said. “It can’t be something that comes from the government. Because once it does come from the government, people lose that sense of ownership. … To actually get that funding, we need to own them in that way.” Michael Anderson. Bike Portland 2/28/14. Cascade Bicycle Club’s new parth: more riding less politics. Tuttle said the new Cascade is more open to partnerships and more thoughtful in its advocacy. Emily Heffter. Seattle Times 2/23/14. KEXP Diane Horn interviews guests Cathy Tuttle, Executive Director Seattle Neighborhood Greenways, and Deb Salls, Executive Director Bike Works about progress made on implementing Seattle greenways, including the work of the Rainier Valley Greenways group 2/3/14. City Leaders Announce Multi-Year Traffic Safety Study. After years of discussions about safety improvements on 35th the city is now committing to action.West Seattle Blog 2/11/14. Neighbors Demand Action After Car Kills Elderly Pedestrian. The organizer of today’s march says St. Clair’s death is the fifth fatal accident along 35th Ave. since 2006. “It’s a place that really needs some focus and city attention,” says Cathy Tuttle, executive director of Seattle Neighborhood Greenways, an organization that advocates for safe streets for people and cars. Mark Miller. KOMO News 1/20/14. 35th SW Memorial Walk organized by Seattle Neighborhood Greenways and peninsula-based groups included members of Mr. St. Clair’s family, High Point residents, and safety advocates from around the city, including former Mayor McGinn and City Councilmember Tom Rasmussen. West Seattle Blog 1/18/14. Memorial Walk for Pedestrian Killed in West Seattle. Family & friends of James St. Clair, who died walking across the street the night of Dec. 30, will march in his memory Saturday afternoon with Seattle Neighborhood Greenways. Mike Lindblom. Seattle Times Blog 1/16/14. Health in Action: Seattle Bike Blog’s Tom Fucoloro. One of the most amazing stories I’ve had the privilege of covering on Seattle Bike Blog is around neighbors organizing groups to promote safe streets where they live. 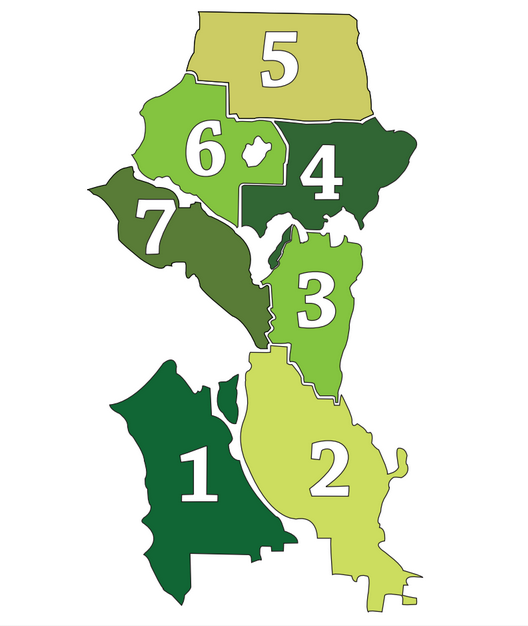 These groups are mostly organized under the Seattle Neighborhood Greenways umbrella that was started by Cathy Tuttle, who is now the group’s director. In essence, neighborhood greenways are routes that connect friendly, but disjointed, residential streets to create complete walking and biking routes that link homes with neighborhood destinations (business districts, community centers, schools, parks and more). But, even more than just routes, neighborhood greenways can become places for neighbors to be neighborly and for kids to play. If we can slow the movement of cars just a bit, the feeling of safety increases immensely. ActivelyNorthwest 11/30/13. Rainier Valley Greenways “Crossing Guard” Action. Let’s envision safer, friendlier streets for all in Hillman City. The Tin Umbrella 11/21/13. Building a bicycling renaissance in Seattle. Seattle used to be the vanguard of bicycling in North America and should reclaim it with a network of neighborhood greenways. John Pucher. Seattle Times 7/13/13. Candidates Talk Safe Streets at Livable Streets Forum. Candidates for the next Seattle Mayor focus on how they would make Seattle safer and more inviting for pedestrians, cyclists, and transit riders at forum hosted by Seattle Neighborhood Greenways. Erica C. Barnett. Seattle Met 7/3/13. Seattle group re-imagines streets as places for people. Building on the success of their first study trip to Vancouver, Seattle Neighborhood Greenways studies the green and safe streets of Vancouver through a similar lens. Kelsea Bloxam. Urban Systems Vancouver 7/6/13. In a disaster, could bikes be part of the answer? a report on Seattle’s first Disaster Relief Trials sponsored by Seattle Neighborhood Greenways. Carolyn Adolph. KUOW. 6/22/13. Remembering Lance David: West Seattleites’ memorial ride. Local bicycling/safety advocates from West Seattle Bike Connections and West Seattle Greenways organized tonight’s ride to both honor a fellow rider and emphasize the urgent need for safety improvements. West Seattle Blog 5/7/13. Locals share ideas at SDOT Ballard Greenways Open House. Local resident Susan Griffith was among many others who thought the greenways project will bring positive changes to the neighborhood. “Bikers come in all ages now, so it is good to have separation between people who want to go faster and people who go slower,” said Griffith. Kevin Lee, My Ballard 4/14/13. Memorial Walk for Safer Streets. Around 200 participated in a Seattle Neighborhood Greenways-hosted memorial walk to the intersection where two pedestrians were killed and two critically injured. NE Seattle Greenways identified the intersection as problematic for pedestrians and cyclists. “Our roads really need to be designed for safety,” said Andres Salomon, with Seattle Neighborhood Greenways. “It really should be a Seattle-wide discussion.” Cara Brannan. Seattle Times 4/1/13. UW Public Health Students Release Little Brook Study. The month-long study was commissioned from students of University of Washington Public Health by the Lake City Greenways project in order to discover barriers to connecting the Little Brook Neighborhood to future proposed Lake City Greenways projects. Lake City Live 3/12/13. Seattle Neighborhood Greenways featured at the Institute of Traffic Engineers. Cathy Tuttle and Eli Goldberg share ideas for engaging citizen groups, business leaders, and city interdepartmental teams, and building support for safe, healthy, walkable, and bikeable communities. Presentation deck. ITE Washington News Feb 2013. Seattle’s Path to Neighborhood Greenways. Portland Bureau of Transportation Presentation deck. 1/17/13. Seattle Neighborhood Greenways wins Sustainable Seattle award. The most powerful result has been simply empowering residents in homes all over the city to retake control of their often dangerous local streets. It’s a simple idea that spread like wildfire. Tom Fucoloro. Seattle Bike Blog 11/16/12. Jeffrey Linn’s personal claim on the public realm puts children first. After a “near-miss” pedestrian crash with his daughter in a stroller, Linn starts Green Lake Greenways to support safe routes to school. Lisa Quinn. Feet First 10/12. Cathy Tuttle, Director of Seattle Neighborhood Greenways, speaks with Diane Horn on Mind Over Matters about Seattle’s neighborhood greenways–dedicated residential streets where bicycles, pedestrians and neighbors’ safety are given priority. KEXP 9/15/12. 2012 Summer Study Trip to Portland Oregon Hosted by Seattle Neighborhood Greenways. Over thirty Seattleites spent the weekend of August 11th and 12th touring Portland neighborhoods collecting information on green streets and innovative stormwater management, Portland’s street design standards, and The Intertwine Alliance. Mike Houck. The Intertwine 8/12. Greenways Get Going in Fremont. What is a greenway from the perspective of a newly formed group, Fremont Greenways. Kirby Lindsay. Fremocentrist 7/30/12. On Seattle’s Neighborhood Greenways, cute kids can roam free. Within just a few years, the Greenway network will connect every neighborhood in the city, providing comfortable, safe access on foot and by bike to retail areas, parks, playgrounds, schools, gardens, and homes. Elly Blue. Taking the Lane 7/27/12. Community Packs Open House for Ballard Greenway. Discussions on implementing a new Ballard Greenway. Zachariah Bryan. Ballard News Tribune 7/27/12. Seattle Neighborhood Greenways: Creating Healthy Streets for All Seattle Residents Interview with Eli Goldberg and Cathy Tuttle. Jessica Roberts & Luke Lamon. Association of Bicycle and Pedestrian Professionals, July 2012. Seattle opening first ‘greenway’ in Wallingford. Marks a shift in the city’s bike-planning efforts and a milestone for residents who advocated for greenways to encourage healthier lifestyles and make it safer for everyone from dog-walkers to kids trudging to school. Scott Gutierrez. Seattle PI, 6/16/12. New city program hopes to help cars and bikes coexist. A new program taking shape in Seattle hopes to tackle the age-old problem of getting cars and bikes to safely coexist on local roads. Eric Johnson. KOMO News, 3/6/12. Cyclists, pedestrians find oasis in Seattle’s urban ‘greenways’ Pedestrians, bikers, others are pushing for greenways — designated streets that offer safer ways of getting around without having to drive. Sonia Krishnan. Seattle Times, 2/12/12. Seattle Greenway Organizers – grassroots at its finest. Less than a year after they officially started working together, the Seattle Greenway Organizers have their first big win! Max Hepp-Buchanan, Cascade Bicycle Club Blog. City’s 10-year bike plan obsolete after 4 years? Just four years after Seattle published its $300,000 Bicycle Master Plan, city officials are considering spending $400,000 more to revise it. Mike Lindblom. Seattle Times, 11/1/11. Seattle Greenways Push Cycling to Side Streets. For some less adventurous riders, the main streets are a little too hectic, a safety issue that often keeps people from even considering a bike commute. The city of Seattle is hoping to change their minds by meeting them halfway. Nate Berg. Atlantic Cities, 10/4/11. Seattle plans side-street pathways for cyclists. Bicycling greenways — networks of residential roads that are outfitted to give cyclists and pedestrians priority over cars. Mike Lindblom. Seattle Times, 9/30/11. Neighborhood greenways create more cycling and walking choices alongside cars. Guest editorial on “neighborhood greenways” that would create more — and more pleasant — choices for bikers and pedestrians in our communities. Dylan Ahearn, Cathy Tuttle and Michael Snyder. Seattle Times, 7/6/11. City’s bike plan has more than commuters in mind Seattle’s cycling network — even with its enviable urban trails and a burgeoning network of bike markings on busy streets — doesn’t always make everyday bike commuting easy. Jennifer Langston. Seattle PI, 9/14/08.